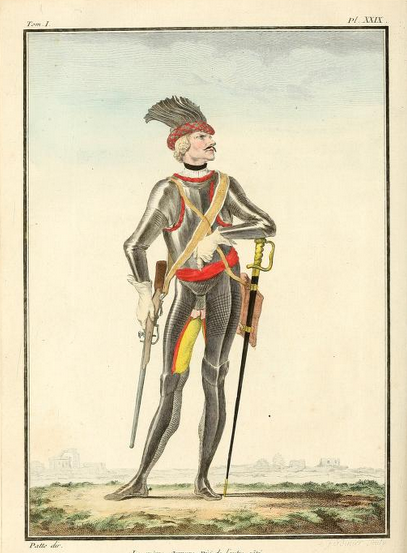 The armour which Maurice de Saxe had made sometime before 1757, from the French edition of Mes Rêveries. Back in 2014 I began a project to address a problem which I noticed. Amateur students of armour seemed to have trouble finding written sources, and historians specialized in one period sometimes seemed not to notice things which I saw again and again in the world history of armour. For example, my reading in the world history of prices in general, and armour prices specifically, makes me read the statement that Athenian settlers needed to bring arms worth 30 drachmas differently than some other ancient historians do (for a list of sources, see Van Wees, Greek Warfare: Myths and Realities, p. 52, plus the Salamis Decree from the Acropolis at Athens). From watching the traffic on my blog, I noticed that if you give people a link to sources, many of them will follow it. In my view, making sources available is the single most important thing which historians can do: interpretations change and are a product of our culture, but sources are foreign and reading enough of them makes it hard to have any simple interpretation of history, or believe that people in other cultures and other times think just like we do. But often sources on armour are published in out-of-print books in a handful of libraries, or available in old translations by people who were not especially interested in material culture. Unfortunately, I have had to put this project aside for two years now, so I think it is time to make sure that my gentle readers know about Armour in Texts. Armour in Texts is a collection of texts which say something important about armour, and advice on how to find more sources from particular periods. My focus is on providing the original language, but where possible I provide a translation. Some texts are hosted on my website, and others elsewhere. If there is a source on armour which you have heard of, and you are from North America or Western Europe and not a professional historian, Armour in Texts will probably let you find it and read it in full, not through a paraphrase or translated translation. Armour in Texts is a work of world history. In principle, anything from the origins of writing to the abandonment of traditional armour belongs, whether slat and coin armour from the Pacific Northwest, or the hide armour in Classical Chinese texts. Right now, it is strongest on the western half of Eurasia, because those are the sources and languages which I know best. However, I welcome suggestions of other texts which could be included! Armour in Texts is a selection, not a universal library. I see it as a resource which someone could read through and learn something important every few pages, not a vast database which drowns readers in details. One day I would like to turn it into a book, translating all the sources in languages which I know myself, and illustrating it to help readers who are not experts in a particular period or culture understand the things which the words pointed to. That said, it might be worthwhile to add a user-submitted tagging system, or a search tool for finding the same term in different languages. In short, Armour in Texts is my own idiosyncratic project, based on my own idiosyncratic skills and interests, meant to help readers find and read primary sources on armour. That said, I would welcome help from specialists in particular periods or languages. While there are many things which I would like to add to Armour in Texts, unfortunately I can’t spare the time. I need to concentrate on writing which pays in cash or credentials, and transcribing and translating sources is slow work. Still, I hope that even in its imperfect state, some of my gentle readers find Armour in Texts helpful.